Provide you with a fair and realistic valuation of your home based on local research, market trends and the knowledge and expertise of over 30 years’ experience in property valuation in the region. Prepare full, accurate property details. We will promote particular attributes of your home that will attract the interest of potential buyers. Perhaps you have a really useful loft room, you may be in the vicinity of a good school, your home may have potential to extend – whatever the advantages you can be sure Partridge Homes will make sure the best features are highlighted and we will take photographs to give the potential buyers a taster of what your home has to offer. As soon as we have prepared your details and you are completely happy with the presentation and content, Partridge Homes will immediately promote your home on Rightmove, the biggest ‘property for sale’ site in the UK. This is where most people either start or end their property search on the web. We will also promote your home on Zoopla and our own Partridge Homes web site. 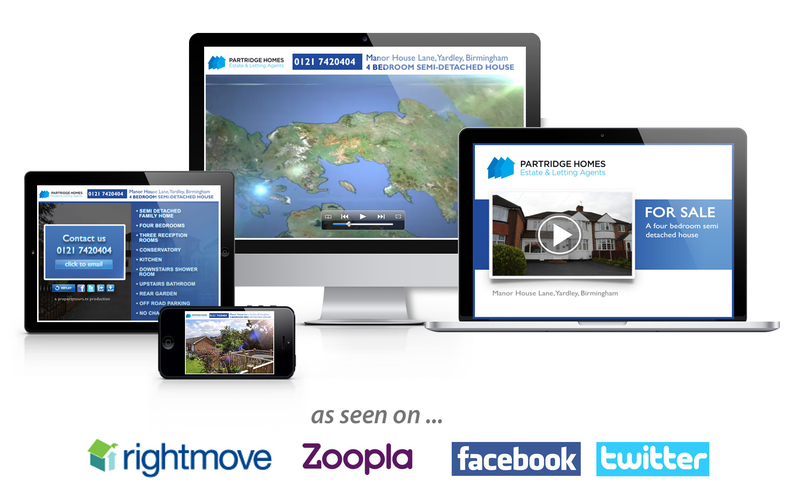 These sites receive hits every day and will give your home an amazing ability to reach prospective purchasers and generate enquiries directly to us here in the Partridge Homes office where we can quickly get viewings arranged. Partridge Homes have Offices in Yardley and Shirley ensuring we cover a wide radius for our clients. Our carefully selected locations include a very popular ‘Landmark’ office on A45 Coventry Rd and our newest office on Haslucks Green Road close to the new Parkgate Centre in Shirley where the public call in daily to check out our sale and rental properties. Details of your home will be displayed in the windows and every one of the family of staff working in the office will know about your home so they can promote it to interested buyers when they call into the office. Partridge Homes take regular advertising space in all of the local property papers. We are always exploring new publications and opportunities to get your home in front of as many potential buyers as possible. Our SECRET WEAPON—shhhh… we don’t want other agents to know just how good our bespoke database matching service is!—We have invested in a very special, purpose made data management system to match all of our customers to the properties we have for sale. So, everyone in the locality who has registered an interest in buying will be matched to properties that Partridge Homes are selling, that could be your home if you sign up with Partridge Homes! Partridge Homes will supply and erect a For Sale board (subject to local laws and regulations) to help attract local interest. Accompanied Viewings – Partridge Homes will happily accompany potential buyers when they view your home. In fact, we have two dedicated members of staff who will get to know your property and help to show it to its best advantage. You can of course conduct viewings yourself if you prefer and we will support you with any advice and guidance you might need. When you sign up with Partridge Homes, you will also receive our information pack with handy tips and advice that combines our wealth of experience and knowledge of selling homes together with some tips from our ever popular TV friends, Kirsty and Phil! Partridge Homes also have a resident Financial Advisor with 25 years’ experience in the Financial Services Industry. They will be able to support potential purchasers with their mortgage and funding applications. They will also offer the same financial service to you if you need it when you are looking for your next home purchase.